This is the Jurassic Park 'clever girl' graduation cap made by some recent graduate. It's not the first time I've seen it done, but I do respect it every time. You know, I didn't go to either one of my undergraduate or master's degree graduation ceremonies. You know why? "You probably got too drunk beforehand." People buy you so many free drinks when you're wearing a cap and gown! Keep going for the clever girl scene from the movie. Thanks to Melissa SF, who is such a clever girl she's the one who invented the clever girl graduation cap idea. 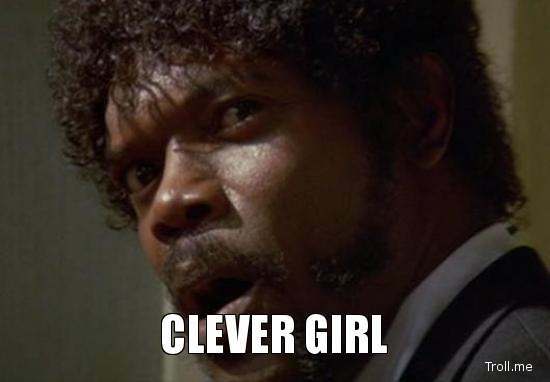 I (over)-use the reference "clever girl" almost daily, and like 1% of people know what I'm referencing. Maybe she was conceived during Jurassic Park, because that movie is 22 years old! Read More: classic, clever girl, getting your learn on, graduation, here's to student debt!, i see what you did there, jurassic park, movies, school's for fools, sometimes i wish i was going back for another degree but then i remember i don't use either of the ones i already have, tis the season, you did it!